I’m still hoping to get some nice graphics made for the title screen and some of the character portraits. But overall, I don’t think the game will look as good as I was hoping it would be. I’m starting to think ahead to release now. I’m still planning for a December release, but that might not happen if I decide I need more time to polish the game up. There will probably still be a beta, demo, or something out by the end of the year even if that doesn’t happen. I’ve also decided against a commercial release for various reasons. That’s right, Ascension 2 will be completely free! I’d like it to also be open-source, but RPG Maker’s license is convoluted and restrictive. 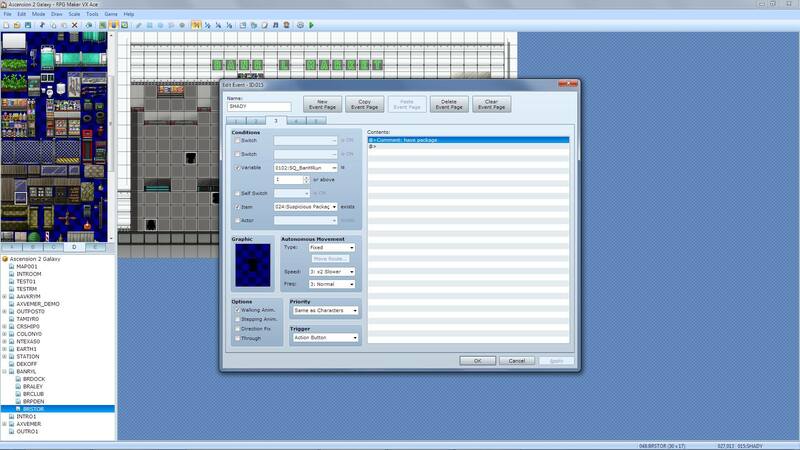 However, I’ll see what I can do about assets not directly derived from RPG Maker ones.